Aarna Systems And Wellness Pvt. Ltd. is an Importer and Exclusive Indian Distributor of BMD Machine, Portable Bone Densitometer, Bone Mineral Density Measuring Equipment, Body Composition Analyzer, Central Dexa Bone Densitometer, Portable Dexa Bone Densitometer and Total Body Dexa Bone Densitometer. 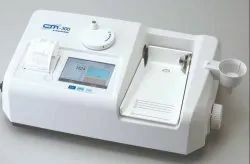 BMD Machine CM-300 measures bone density of human heel using ultrasound. The result is printed out with graph format chart from a built-in printer. Also adjustable Foot Plate (5 levels) and Temperature Compensation feature provides accurate results. With easy-to-use interface of the color touch screen, CM-300 is most suitable for screening test of osteoporosis.